Sometimes the simple designs work the best, and this personalised est coaster is no exception. Personalised with your required name or nickname and the year they were established (optional). Makes a quirky yet practical gift for children and adults. Suitable for Birthdays, Christmas, Mother's Day, Father's Day and so on. This design work especially well for new parents, grandparents or even a newly wed couple. For example " Mummy established 2015", "Grandad established 2014" "Mrs Wilson est 2017" and so on. The coaster itself measures 95 x 95mm , is corked back and heat-resistant. Finished to the highest standards which give the coaster a beautiful high gloss finish. We design and print all our own coasters in our Somerset studio especially for our customers. When you buy from Name it Labels, you can be confident you are purchasing a product of excellence. 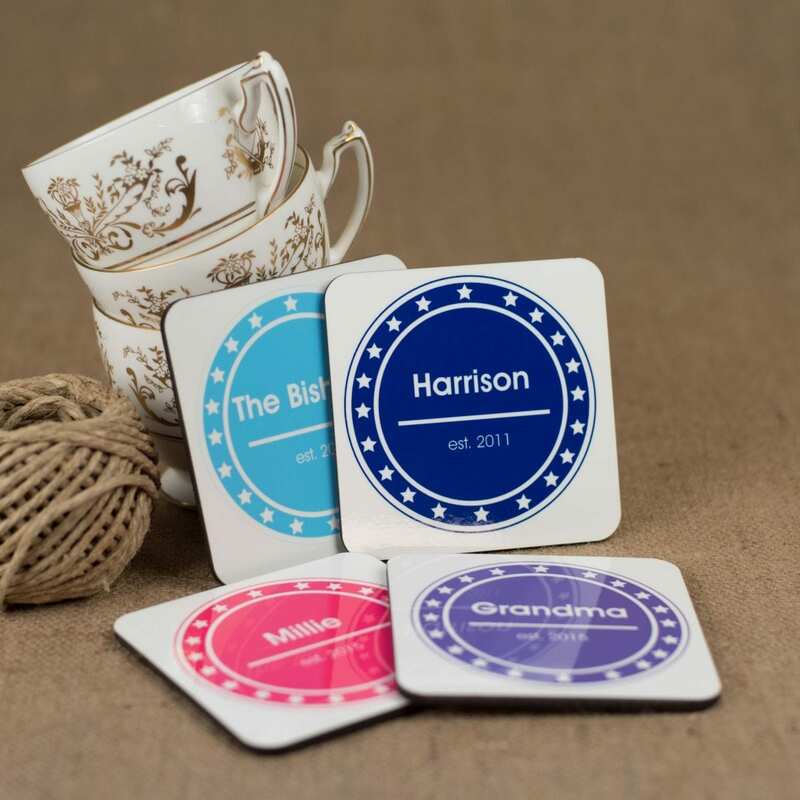 Customers love our range of colours, but above all the classic design which makes our personalised est coaster something you will be happy to give as a present. If we have not listed a colour you would like, simply email sales@nameitlabels.co.uk and we will be happy to assist. All you have to do is tell is the name or nickname and the year established. The established year is optional and you may choose to just have the name of your choice printed. As each coaster is especially printed for you, we cannot accept returns unless faulty or damaged.